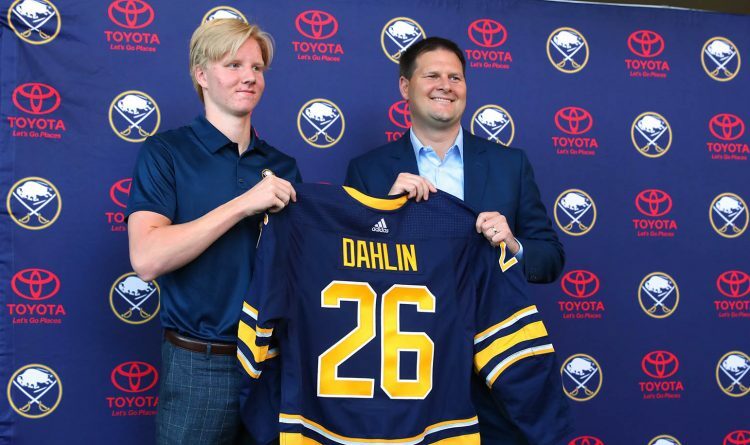 After a game in which they kept their noses to the grindstone for 65 minutes, a quick apology to the Sabres for the first thing that popped into this corner's head on Selection Sunday night. In a day featuring a quasi Buffalo-St. Louis doubleheader, the wrong Buffalo team won. How sweet it would have been for a few more St. Bonaventure shots to have dropped home at the other end of the state, giving the upstart Bonnies a win over Saint Louis and a very unlikely NCAA Tournament berth. But the ball didn't bounce the Bonnies' way at the end of one of the best coaching jobs of Mark Schmidt's career. So for this Sunday, the Sabres' luck will have to do. It came when old friend Ryan O'Reilly's final shootout attempt clanked off the crossbar to clinch a 4-3 victory over the St. Louis Blues. This was a fun game against a team heading to the playoffs. The KeyBank Center crowd was listed as 18,486 and that was pretty close. And there was real, live cheering because the Sabres made plays at the offensive end, got several timely saves among Carter Hutton's 30 stops and were engaged physically all night. This team has been flat-out soft far too often this season. Not Sunday. They were actually hard to play against and the paying customers loved it, especially in the third period. It's not too much to ask. A smiling captain Jack Eichel used the word "rambunctious" to describe the crowd. And as wordsmithing goes, Eichel was bang-on. "I think with the 5 o’clock Sunday St. Paddy's Day start, it probably gave the locals enough time to have a couple drinks, enjoy the parade and come over to the game with a little buzz going to enjoy it," Eichel said. "It was good to see the crowd getting into it. It was good to see the guys getting engaged, finishing checks. I think the more we do that, the better it will be for our group." There have been too many nights the last three months when you could have accused the Sabres of tossing no-hitters on the ice. This wasn't one of them. The building was roaring at one point late in the third period — and this, remember, was for a team that entered the game 15 points out of the playoffs and tied for the NHL's worst record since Dec. 1. 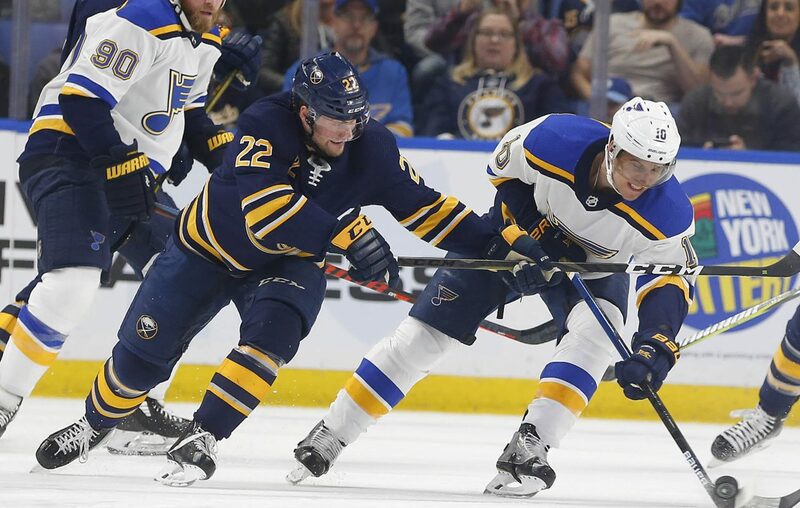 The Sabres kept putting bodies on Blues. On one shift, Johan Larsson, Zemgus Girgensons, Casey Nelson, Kyle Okposo and Marco Scandella all registered a hit within a span of 27 seconds. There's a lesson there. Hockey is supposed to be a combination of skill and physicality. The Sabres need to find more of that. "We appreciate the crowd getting into it," Hutton said. "It gives us a lot of energy getting into the last bit of the game there and it was a lot of fun for everybody." 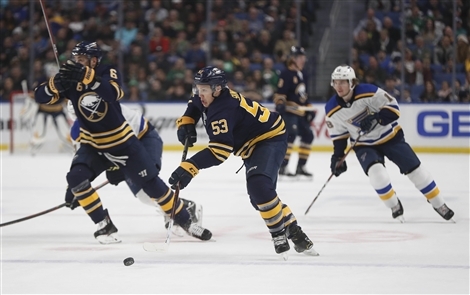 There was a lot to like in this game as the Sabres snapped their seven-game losing streak, cutting it off three games away from becoming the first team in NHL history to win 10 in a row and lose 10 in a row in the same season. Alexander Nylander played his best game in the NHL, skating well and collecting two assists. Memo to Phil Housley: He's got to play more than 11:40 Wednesday against Toronto when his brother is in town. Larsson had a goal off a nifty Zach Bogosian feed and a team-high four hits. Evan Rodrigues and Conor Sheary, who has been Buffalo's best forward the last two weeks, scored goals to benefit from Nylander's setups. Eichel improved to 4 for 8 on shootouts this season with a laser past Jake Allen, and pointed out how Buffalo goalie coach Andrew Allen has done a good job providing scouting reports on opposing goalies. Buffalo is 5-3 in shootouts this year and its shooters are a solid 12 for 31 this season. In the other crease, Hutton was strong in overtime as he battled to make six saves in a performance that was reminiscent of his seven-stop extra session March 7 in Chicago. Hutton then went 0 for 3 in the shootout that night. Not here. He stopped 2 of 3, getting crossbar luck on the O'Reilly attempt. The crowd was roaring again as the former Sabre approached the puck. "It's a bad shot. Didn't go in," O'Reilly said. "Move's OK, just the finishing. I love that pressure. I think it's one of those moments that you live for. It's exciting. Obviously I just came out on the wrong end of it." "It's exciting to see them into the game," Sheary said of the fans. "We want to be good for our fans and we want to be good on home ice. Of late, we haven't been and tonight was a rewarding win for us." Hutton was just 1-6-2 in his last nine decisions and only 4-14-4 since Buffalo's 10-game winning streak ended in November. He badly needed a win. "It was a fun hockey game for everybody involved," Hutton said. "It was pretty wild there for the last few minutes and overtime. It's obviously rewarding going against a team you've played for and it's the first time I've beaten them (after going 0-3-3). I relish the moments — playing a lot of friends over there." The Sabres improved to 20-12-4 this season at home, far better than their 11-20-4 mark on the road that sank their season. Now one tiny request: Beat the Toronto Maple Leafs here Wednesday. Win two in a row for the first time since mid-December. There will be plenty of noise again, thanks to visiting fans. See if your own fans can celebrate a little more before we all turn our attention back to UB's hoop dreams.